I have a 2010 15-inch MacBook Pro. I pulled out the DVD drive that I never used and installed an SSD drive. Lately, the MacBook has been crashingdisplaying a black screen and then a message that I have to restart. Did installing the SSD drive break my Mac? No. Ive seen reports of this happening with this particular modelwith and without an SSD installed. The consensus is that the computers NVIDIA GeForce GT 330M graphics card is to blame. This MacBook has the ability to switch from high-performance graphics to on-board graphics and switching from one to the other can cause these black screens and kernel panics. You could also try the free gfxCardStatus application. 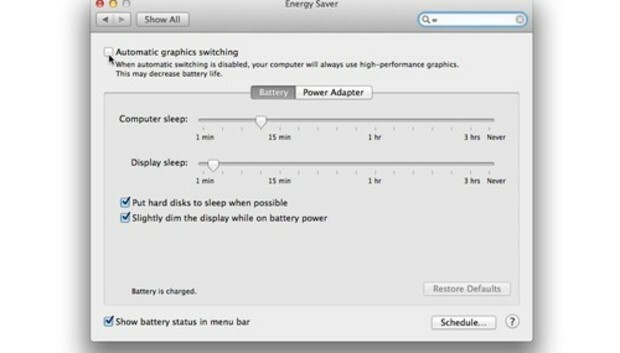 This places a menu in the Macs menu bar that allows you to choose one graphics card or the other. This issue has been acknowledged by Apple in its MacBook Pro (15-inch, Mid 2010): Intermittent black screen or loss of video KnowledgeBase article. For your purposes the most important passage of that article reads: Apple will service affected 15-inch MacBook Pro computers free of charge until three years from date of purchase. If it were my laptop, Id take it in to your local Apple Store or Apple Authorized Dealer (or, if you dont have a local Apple Store, contact Apples support and service folks at 1-800-275-2273 in the U.S.). The problem doesnt affect all mid-2010 15-inch MacBook Pros. If you're not Ted and haven't seen this problem with your MacBook Pro then your laptop isn't affected.